Shornhelm Champion is an epic Sorcerer creature card. It is part of the Core Set. "I'll slice you ear to ear!" This card's ability applies the Shornhelm Retribution card effect. 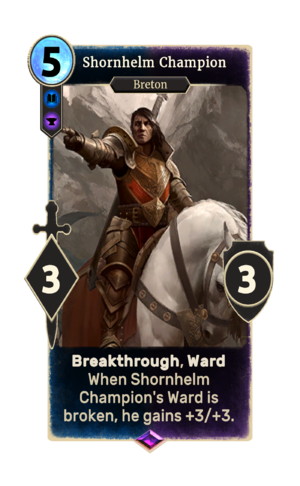 The card is named for the High Rock city of Shornhelm. This page was last modified on 16 February 2019, at 15:43.